Welcome to the Anglo-Catholic History Society pages. The Society was formed in 2000 and seeks to promote the study of the history of the Anglo-Catholic movement in the Anglican Communion. 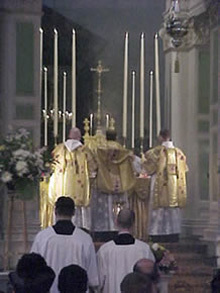 This includes the High Church movements from the late sixteenth century as well as the Oxford Movement itself, Ritualism and Anglo-Catholicism in the nineteenth and twentieth centuries, both in England and elsewhere. The Society meets three times a year in various London churches for a lecture – these are usually held in early October, late January and June. For more details see our Events page. Lectures cover a variety of topics in the subject fields mentioned and are made accessible for those with different levels of expertise and knowledge. The Society is open to all. For more details about the Society, please see our What we do and ACHS History pages. For more information contact the Secretary, Mr G. Brent Skelly at 24 Cloudesley Square, London N1 0HN or by email.